Fun wedding themed badge. 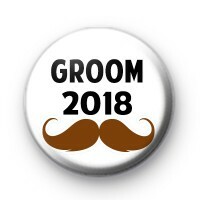 This white & black 25mm badge has the text Groom 2018 & a hipster brown moustache. It would make a fun addition to a Stag Party or just to wear to let people know you're getting married. We have so many wedding badges in the shop many of which can be customised. Our handmade badges make lovely keepsakes & they're popular to give out to your guests.